VANCOUVER, BRITISH COLUMBIA--(Marketwired - Dec. 10, 2015) - Eurasian Minerals Inc. (TSX VENTURE:EMX)(NYSE MKT:EMXX) (the "Company" or "EMX") is pleased to announce that IG Copper LLC ("IGC") advises that an additional license has been granted for the Malmyzh copper-gold porphyry project in Far East Russia. The Malmyzh licenses are held by IGC (51%) and Freeport-McMoRan Exploration Corporation (49%) (the "Joint Venture"), with IGC operating and managing the project. The new "Malmzyh Flanks" exploration license expands the Joint Venture's land position covering the Malmyzh district for a total of 226.9 square kilometers, and includes additional areas for potential infrastructure development as well as extensions to known exploration targets. EMX is IGC's largest shareholder with 42.2% of the issued and outstanding shares. Please see the attached map and www.eurasianminerals.com for more information. Malmyzh Flanks Discussion and Project Overview. The Malmyzh Flanks exploration license (74.1 sq km) surrounds the previously granted Malmyzh and Malmyzh North exploration and mining licenses (152.8 sq km) on three sides, and provides additional areas for potential development with improved access to the Amur River. In addition, the new license includes a projection of the Freedom "magnetic cluster" to the north-northeast, and possible extensions of the reconnaissance drilled copper-gold mineralization at the North Slope and Destiny prospects. This exploration potential further highlights the project's upside, which includes four inferred resource deposits open for expansion and eight additional prospects with drilled porphyry copper-gold mineralization. 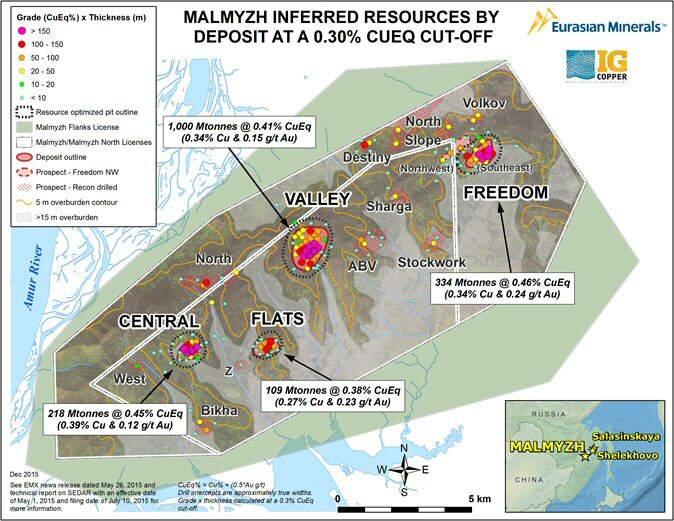 The Malmyzh project's inferred resources include the Valley, Freedom (SE), Central and Flats deposits. The open pit constrained inferred resources at a 0.30% copper equivalent cut-off are 1,661 million tonnes at average grades of 0.34% copper and 0.17 g/t gold, or 0.42% copper equivalent, containing 5.65 million tonnes (12.45 billion pounds) copper and 9.11 million ounces gold, or 7.06 million tonnes (15.56 billion pounds) copper equivalent (CuEq% = Cu% + (Au g/t x 0.5)). All four resource deposits are open at depth (> 350-600 m), and importantly, there are zones of shallow, higher grade copper-gold mineralization at the Valley and Freedom (SE) deposits, and high grade below the resource pit at Central. Furthermore, there is higher grade copper-gold mineralization at the Freedom (NW) prospect not currently included in the Malmyzh inferred resource estimate due to the need for in-fill drilling. Please see EMX news release dated May 26, 2015 and SEDAR filed report titled "NI 43-101 Technical Report on the Initial Mineral Resource Estimate for the Malmyzh Copper-Gold Project, Khabarovsk Krai, Russian Federation" with an effective date of May 1, 2015 for more information1. The Joint Venture is proceeding with acquiring project approvals to continue with the "advanced exploration and mining phase" of development as required for "strategically significant" deposits in the Russian Federation. IGC has informed EMX that the process is moving forward at a steady pace. Government support for IGC and the Joint Venture is underscored by the recent award of a "Certificate of First Discovery" for the Malmyzh project. This important acknowledgement officially recognizes the Joint Venture's sole responsibility for an important grassroots discovery and serves to further underpin support for achieving government approvals. This recognition is complemented by the "Explorer of the Year" award received at the recent MINEX Forum in Moscow. Overall, the Russian government strongly supports mining investment and development in their Far East Krais (administrative regions), as evidenced by IGC's recent agreement with the Far East Development Fund to facilitate high-level investments from across the Russian Federation and Asia (see EMX news release dated November 4, 2015). Taken together, IGC is encouraged by, and appreciative of, these strong measures of support for advancing a project recognized as an exceptional asset with world-class potential. 1 Phil Newall, PhD, BSc, CEng, FIMMM, a Qualified Person under NI 43-101 and managing director of Wardell Armstrong International, an independent UK based consulting company, provided the statement of Malmyzh open pit constrained inferred resources effective as of May 1, 2015 under NI 43-101 Standards of Disclosure for Mineral Projects and CIM definition standards. Copper equivalent was calculated as Cu% + (Au g/t x 0.5), and assumed prices of $3.25/lb Cu and $1400/oz Au, with recoveries of 90% for Cu and 70% for Au. See May 26, 2015 EMX news release and SEDAR filed technical report for more information on the CuEq calculation, exploration results, QA/QC procedures, and methodology used to estimate the Malmyzh inferred resources. IGC's Shelekhovo Project. IGC has 100% control of the 390 square kilometer Shelekhovo property (also known as Shelekhovskaya). IGC recently completed geologic reconnaissance, a ground magnetic survey, and a soil survey consisting of approximately 1,500 samples. The program focused on an interpreted nested caldera complex adjacent to the regional scale Sikhote Alin structural zone in an area marked by multiple gold anomalies and abundant quartz-alunite alteration identified from Soviet-era work. IGC's geologists confirmed the widespread occurrence of quartz-alunite alteration in a geologic setting characteristic of a high sulfidation epithermal system. Results from the program are expected to be available in early 2016. EMX's strategic investment in IGC exemplifies the Company's recognition of an early-stage opportunity with excellent growth potential. IGC has steadily built value at Malmyzh and added quality exploration properties to its portfolio. EMX is IGC's largest shareholder with 42.2% of the issued and outstanding shares (38.4% on a fully diluted basis) resulting from investments totaling US $7.8 million. Readers are cautioned not to place undue reliance on these forward-looking statements, which speak only as of the date of this news release or as of the date otherwise specifically indicated herein. Due to risks and uncertainties, including the risks and uncertainties identified in this news release, and other risk factors and forward-looking statements listed in the Company's MD&A for the nine-month period ended September 30, 2015 (the "MD&A") and most recently filed Annual Information Form for the year ended December 31, 2014 (the "AIF") and Form 20-F for the year ended December 31, 2014, actual events may differ materially from current expectations. More information about the Company, including the MD&A, the AIF, financial statements and Form 20-F of the Company, is available on SEDAR at www.sedar.com and on the SEC's EDGAR website at www.sec.gov. This news release uses the term "Inferred Resources". We advise U.S. investors that while this term is defined in, and permitted by, Canadian regulations, this term is not a defined term under SEC Industry Guide 7 and not normally permitted to be used in reports and registration statements filed with the SEC. "Inferred Resources" have a great amount of uncertainty as to their existence, and great uncertainty as to their economic feasibility. It cannot be assumed that all or any part of an Inferred Mineral Resource will ever be upgraded to a higher category. Under Canadian rules, estimates of Inferred Mineral Resources may not form the basis of a feasibility study or prefeasibility studies, except in rare cases. The SEC normally only permits issuers to report mineralization that does not constitute SEC Industry Guide 7 compliant "reserves", as in-place tonnage and grade without reference to unit measures. U.S. investors are cautioned not to assume that any part or all of mineral deposits in this category will ever be converted into reserves. U.S. investors are cautioned not to assume that any part or all of an Inferred Resource exists or is economically mineable.